The last time we visited Northwestern, they were struggling to finish off Penn State and lost a tough game at home. Three weeks later, the Wildcats have put together two straight wins including last week’s stunning upset at #10 Nebraska. Funny thing- It always seems like every year, Northwestern loses to someone they have no business losing to (this year, Army) and defeating a team they have no business beating (this year, Nebraska). Now, Rice comes in having to confront these confident Cats. 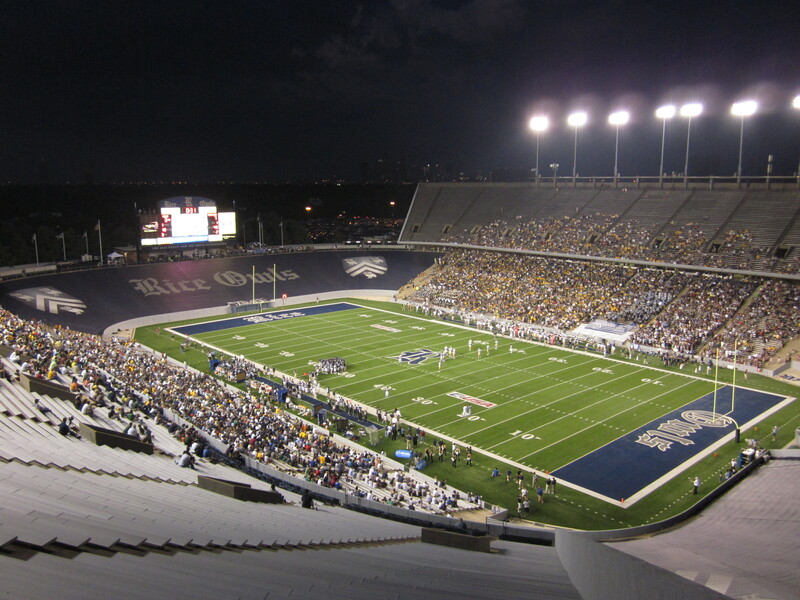 Compared to the surroundings of their hated rival, Houston, the campus of Rice is like a little slice of “Oz,” and Owl fans know it. It’s a twelve minute drive from UH to Rice and the scenery changes from boarded up houses to old southern style oak tree lined streets. Rice is an outstanding academic institution that tends to seem out of focus when it comes to their football program. Despite some recent bowl success, the Owls appeared doomed to roost among the average in Conference USA. Further evidence of this came on this night when Baylor came to town. Of the mere 23,000 fans that showed up, around half displayed green and yellow in support of their Bears. Rice fans were not very vocal. However, their team did not provide them with much to exercise their vocal cords. In fact, the only thing that appeared to stop the Baylor offense was a lightning delay early in the second quarter.